They’re here! The trees have arrived, and they look absolutely fabulous! The decorators arrived at 9 a.m. Friday morning and began to gussy up the trees amid carolers, cookies and kids — lots and lots of kids. What is just out of the frame of the picture below is the 1,500 kids that arrived on field trips while the decorating was underway. All in all, a busy morning at HMNS! I like bugs, so I was immediately drawn to the spider webs on this tree. 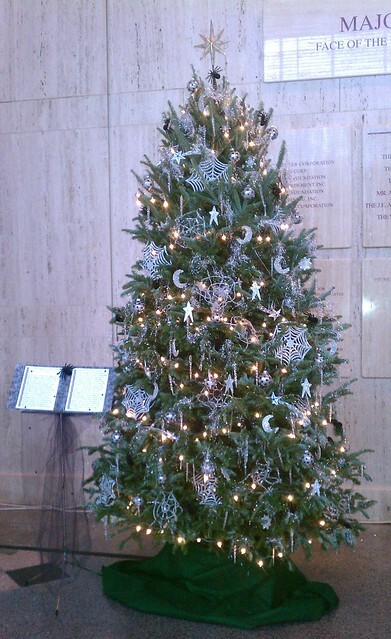 The story next to the tree explains why the spider is associated with a traditional Ukrainian Christmas. 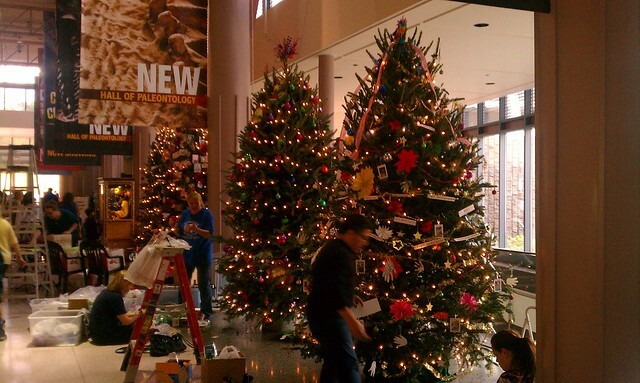 This next tree was decorated by the Museum’s volunteer guild, which is also responsible for organizing the holiday tree project. 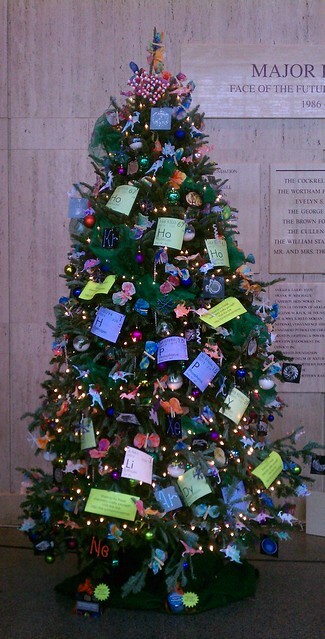 I love the colors, and most of all I love the fact that nearly every known critter is represented on the tree! Where else can you find a Christmas tree with crayfish and coelacanths, I ask? 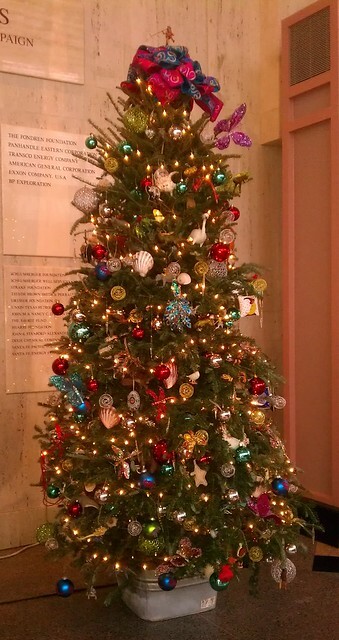 The Houston Conchology Society always has a beautiful tree, and this year is no exception! Each of the letters and snowflakes are covered in tiny shells like those used in sailor’s valentines. And, drum roll please . . . the tree you may (or may not) have been waiting for . . . 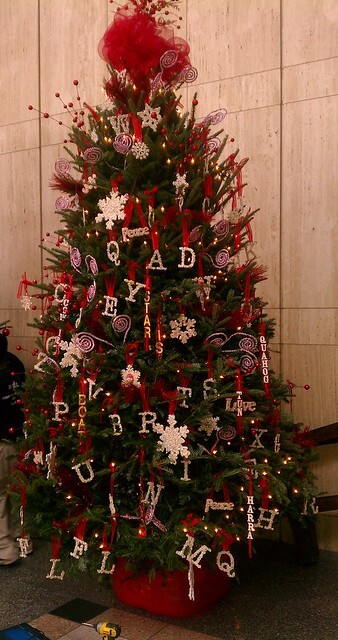 If you look carefully at our chemistry tree, you can just make out the “H P P Y Ho Li Dy S” banner made up of element symbols for Hydrogen, Phosphorus, Yttrium Holmium, Lithium, Dysprosium and Sulfur. If you have no idea what Holmium is or what Yttrium can be used for, you should check out the Welch Chemistry Hall. Can’t make it in? Learn how to make these fun chemistry crafts here or check out some fun chemistry kits at the Museum Store — now online just in time for the holidays. Previous Post Win a stay at the Viceroy Riviera Maya and experience Maya culture in person with the HMNS Go Out in Style Sweepstakes!